The Supreme 530 Microfiber Towel Pair includes two of our softest buffing towels in two different sizes to suit multiple detailing jobs. Use these towels for buffing, dusting, and drying. Supreme 530 Towels are safe on every automotive surface. The Supreme 530 Microfiber Towels get their name from their incredible thickness. Microfiber weight is expressed in "grams per square meter" or g/m². The thickness of a microfiber towel is directly related to its weight. Higher weight = higher density = a thicker towel. At 530 g/m², the Supreme 530 Microfiber Towels are incredibly thick and plush! The unique blend of 75% polyester and 25% polyamide gives the towels a balance of softness and toughness to perform any detailing task. Buff paint, dust the interior, clean glass, and dry your vehicle with these versatile towels. The Supreme Large Microfiber Towel is a generous 16 x 24 inches, making it ideal for buffing and drying your vehicle. 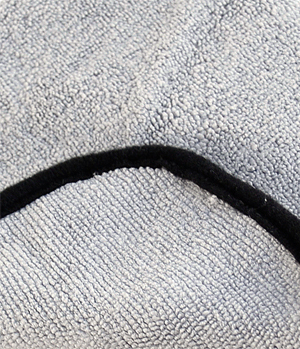 This thick microfiber towel feels too luxurious to be a detailing towel! Wipe off quick detailers. Buff away smudges and fingerprints. The larger size is ideal for buffing and drying larger vehicles. Both Supreme 530 Microfiber Towels feel as soft as the finest chenille. They glide over the paint, grabbing dust and massaging the paint to a brilliant shine. The nap is deep enough to pull light dust and dirt away from the paint surface where it cannot scratch. The microfiber-covered hems and removable tags further ensure a swirl-free detail. The Supreme 530 Microfiber Towel Pair is a great value for two outstanding detailing towels. A total retail value of $20.98. Save $3.99!